Heineken is a concept. 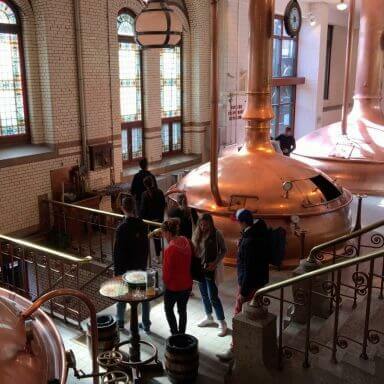 Tourists from all over the globe visit this historic brewery located in the centre of Amsterdam. It’s quite embarrassing to admit, but until recently I had never set foot inside. After pointing out the route to the Heineken Experience to various tourists for the hundredth time, I decided it was high time I went to see the brewery for myself. I visited the brewery on a rainy afternoon together with a group of friends. We had no idea what to expect, but we were very eager to find out. The moment we entered the building, I realised how incredible the interior was. You are catapulted back in time; everywhere you look, elements of the old brewery, even the original boilers, catch your eye. Yet despite this, the entire Heineken Experience incorporates an extremely modern feel thanks to the brewery’s use of high tech gadgets. 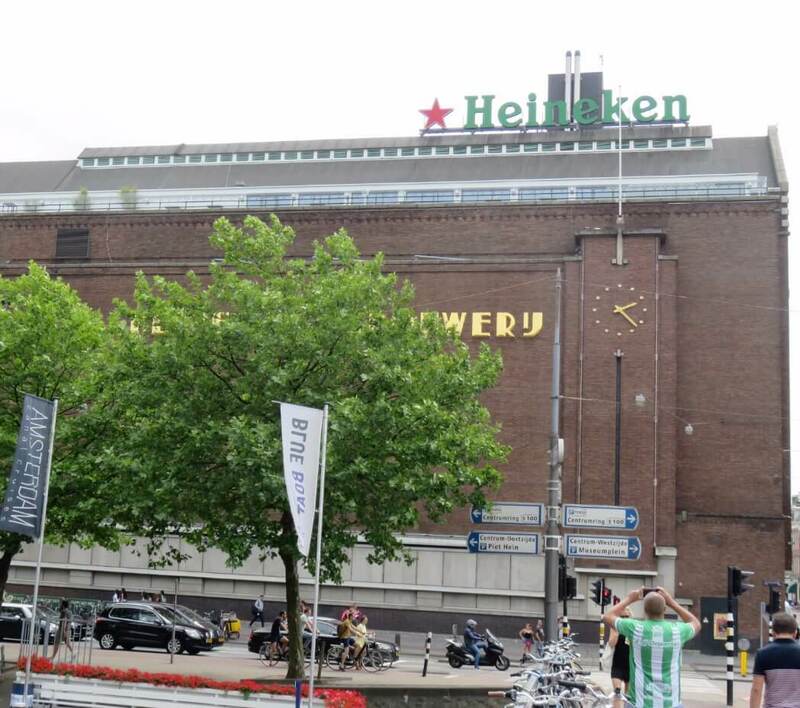 The historic Heineken brewery in the centre of Amsterdam. You will find many original features in this historic brewery, such as these copper kettles. We were able to explore the brewery independently, but there were plenty of staff on hand to answer any questions or entertain us with an anecdote. They were all incredibly friendly and we felt very welcome. The initial stages of the Heineken Experience concentrate on the history of Heineken, showing the various advertising used, and offering you the opportunity to visit the old stable block which still continues to be used today. My tip: purchase your ticket online beforehand! Buy your ticket online now, and avoid the long queues. Tickets are valid for an entire year, so even if you are not sure when your Heineken Experience visit will take place, you can still purchase your ticket! For children under 11 years, admission is free. A ticket can be easily purchased here. After you have walked through the Heineken history section, the entire beer brewing process is then explained in detail. As this is a very interactive tour, you will not be bored. 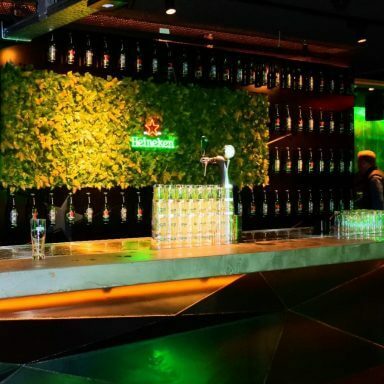 You can even tap your own beer, enjoy beer tasting, buy a bottle of Heineken with your name printed on the label, or take a photo in the Heineken photobooth. You will end your Heineken Experience tour at the Rooftop bar, located on the 6th floor. Two beers are included in the ticket price, and you can sit down and chat with other visitors. Great fun. Informative and a stunning view over the city of Amsterdam. Totally recommended. We had purchased our tickets beforehand and skipped the queues, which on a Saturday can be quite long. The Heineken Experience might not be everyone’s idea of an interesting day out. If you are not a beer drinker or have no interest in the brewing process, you might prefer to focus your time on some of the other many cultural attractions Amsterdam has on offer. However, if you are a fan of Heineken and if you know you will get something out of the opportunity to increase your brewing knowledge, the Heineken Experience is definitely worth a visit! After your tour of the brewery, you will be given the opportunity to enjoy a tasty beer! All ticket holders receive two tokens; however, not everyone who enjoys the tour drinks beer. With a little gentle persuasion, you can always use someone else’s tokens! The Heineken Experience is open every day. The last tickets are sold at the ticket booth two hours before closing, which makes sense as the Heineken Experience tour lasts for for 1.5 hours. During low season, the Heineken Experience is open from 10:30 a.m. to 7 p.m. from Monday to Thursday, and from 10.30 a.m. to 9 p.m. from Friday to Sunday. In July and August, the Heineken Experience is open every day from 10.30 a.m. to 9 p.m. The Heineken Experience has a very central location. Even so, you will not have any problem parking as there are many parking garages. Public transport is also ideal; trams 16 and 24 leave from Centraal Station and drop you off right in front of the door (Stadhouderskade stop). The Hop on Hop off bus also stops at the Heineken Experience entrance. You can buy bus tickets in a few short clicks using the link here. Free beers? Count me in! 655 visitors rated Heineken Experience average 4.95 stars out of 5.